Thanks to the internet, customers today have more power than they ever had in the past. Customers are known to make or break businesses. And, that is the reason why businesses try to do everything in the book to keep their customers happy and satisfied. When customers have a positive experience, they share it with their friends, family and colleagues – which results in new business. But what happens when your customers are not satisfied? They complain. And, as research by Esteban Kolsky suggests, 13 percent of unhappy customers are expected to share their complaint with 15 people or more. 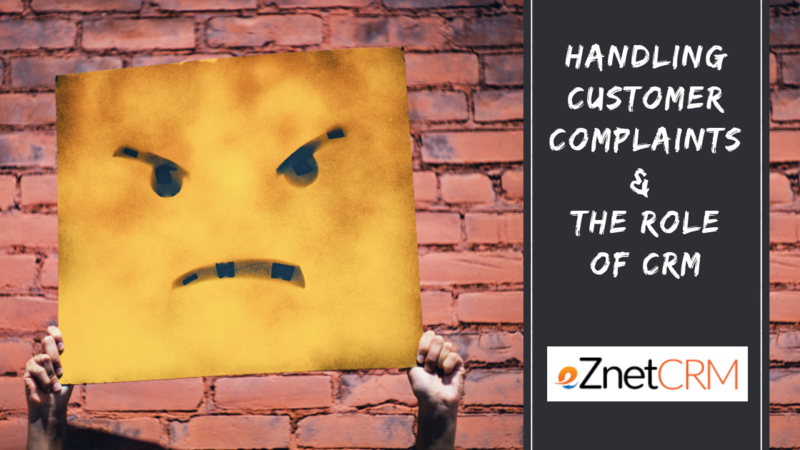 Moreover, only one in 26 unhappy customers comes directly to you with a complaint – the rest churn. As a business, you should always look at complaints from a positive perspective. In most cases, when a customer has a complaint, there is some problem with your product, internal processes, or employees. When the problem is highlighted by your customer, you can take corrective measures. It will not just make your customer happy; it will also ensure that rest of your customers don’t face any issue on that front in the future. Companies want to avoid complaints, but those with managers who considers a complaint an opportunity to improve will achieve greater customer satisfaction and an outstanding reputation. Listen to your customers – When your customers complain, it is vital for you to learn the reason. Customers are more concerned about quality than just a fast response. When you give them time and listen, it shows a caring attitude that goes a long way. Of course, you must follow up with corrective action, and make sure the reason is addressed to prevent similar complaints from other customers. Never underestimate the value of an apology – On many occasions, customers are looking for an acknowledgment of their complaint, and an apology. Still, there are businesses that hesitate in admitting their mistake. Unhappy customers are more likely to forgive a company that offers an apology. Offer an apology and follow it up with an assurance to resolve the problem – then do it! Make sure you find a solution – If your customers have a genuine complaint, you must quickly resolve it. Empower your customer service representatives to handle the bulk of customer complaints. It is annoying for customers when they’re transferred from one person to another. Always follow up with your customers – It is important to find out whether your customers are satisfied with the solution you have offered. You can send a follow-up email or conduct a survey asking them for their feedback on how the complaint was handled. Customers who feel ignored don’t remain customers for much longer. It is also important to monitor customer complaints. You can do it on a weekly or monthly basis, which will help you track new complaints and trends in areas in which your company’s performance, products or service may be deficient. Keep in mind that not all customers complain directly to your customer service department. The internet allows people to vent their anger on various channels that include social media platforms, review websites and others. Failing to take a proactive approach by not monitoring and addressing such comments and reviews can have a detrimental effect on your company’s reputation. A CRM system helps develop strong customer relationships. You can use the software to organize all your customer data, integrate CRM data with the customer service department and keep your customers engaged. A CRM software helps you manage all your customer information effectively – With a CRM system in place, you can organize and manage all your customer data effectively in a centralized CRM database. Also, with a CRM software, you can keep track of your customers and prospects through various customer channels like social media, blogs, website, email, etc. which improves customer engagement. When you monitor all the channels properly, you can handle customer complaints more effectively and quickly. And, when you solve your customer’s problem quickly and efficiently, your customers remain happy with you which generates trust. You can integrate CRM data with your customer service department – Your customers are short on time. No one likes to be put on hold on for long and repeat their problem over and over again. But when you integrate the CRM data with customer support services, your customer service representatives get all the customer data on their screen, which helps them resolve the issue more efficiently. It improves customer engagement – A CRM system provides access to all available customer data in just one click. You can track your customer’s purchase history, which helps you improve engagement. When you know what they have purchased from you, whom they have contacted in your organization, and the complaints that they have had with your products or services in the past, you are better equipped to resolve the issue. With all the information in front of your screen, you can offer a personalized solution to a dissatisfied customer. Of course, putting out fires is sometimes necessary. However, as our November 2018 blog post explored, a CRM system is the ideal means for building and sustaining long-term customer satisfaction. Our eZnet CRM is a cloud-based system that provides an unparalleled feature set designed to deliver seamless integration with your current business model. Contact us to learn more and get started with a free 30-day trial to be confident that eZnet CRM is the ideal solution for your business.